Altar rails are making a comeback and with their return so is reverence. It is becoming more common these days to see the installation of rails as an integral component of liturgical reform and church architecture. From dioceses as diverse as Charlotte, North Carolina to Madison, Wisconsin the rail has returned. To be clear, there was never a requirement to remove altar rails (also called communion rails) in the years following the Second Vatican Council. However, there were many in the Church who aggressively sought to remove that which was considered traditional and sacred. Gone were the high altars, beautiful Catholic statuary, and of course, altar rails. A liturgically misguided attempt at egalitarianism ruled the post-conciliar landscape, one which challenged the very distinction between sanctuary and nave. Overtones of anticlericalism were pervasive, as was a new type of Catholic worship, one intentionally structured for ecumenical purposes. By their very presence altar rails hindered the march toward the profane desired by many. With such liturgical innovations as Extraordinary Ministers of Holy Communion and most particularly the practice of Communion in the hand, altar rails were an affront to the moderns. In the new, democratic, liturgy kneeling had simply become outdated and uncouth. In his seminal work “The Spirit of the Liturgy” Cardinal Ratzinger noted that, “The man who learns to believe learns also to kneel, and a faith or a liturgy no longer familiar with kneeling would be sick at the core.” In recent years, however, there has been a slow yet steady healing occurring within the liturgy. Altar rails are contributing to the restoration of the sacred and the recovery of reverence within the Holy Mass. At my home parish of St. Ann’s in Charlotte, North Carolina the rail returned with the 2009 renovation of the church. 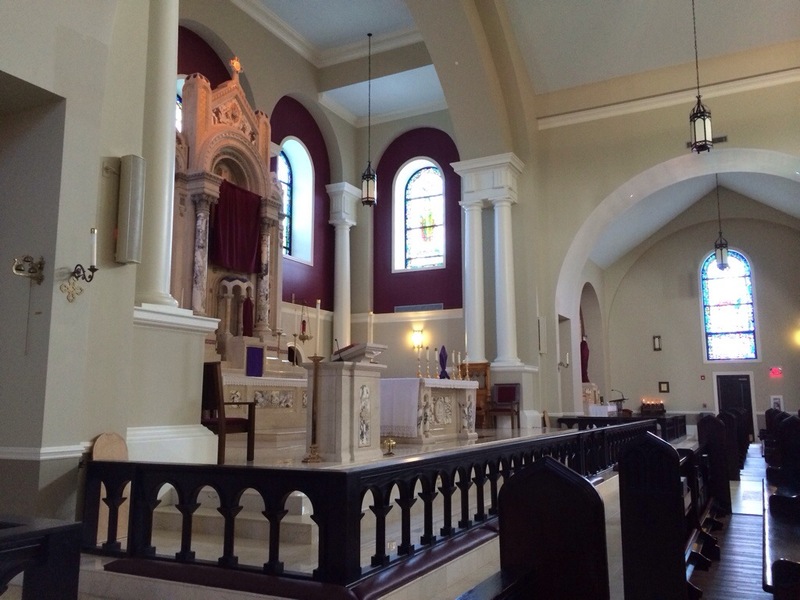 The altar rail was installed to accommodate the Traditional Latin Mass which was offered weekly. Over time the use of the rail was expanded to include all masses, whether offered in the Ordinary form or Extraordinary form. The altar rail has also returned to Sacred Heart Catholic Church in Salisbury, North Carolina (also in the Diocese of Charlotte). While the new church was completed back in 2009, the rail was not installed until just last year in support of the weekly Sunday Traditional Latin Mass. More recently there is also the story of St. Mary’s of Pine Bluff, Wisconsin. Father Richard Heilman, pastor, had the altar rail installed earlier this year following a $20,000 gift from an anonymous donor. Overall the return of the rail has been well received by his parishioners. Since Fr. Heilman was already offering the mass ad orientem, and using kneelers for the faithful at Holy Communion, the reintroduction of the altar rail made perfect sense. More importantly, Father has seen reverence for the Eucharist continue to grow. Much like St. Ann’s in Charlotte, the majority of parishioners at St. Mary’s of Pine Bluff choose to receive Communion on the tongue. Pray that more Catholics are blessed to experience the return of the altar rail to their parish and to receive Holy Communion while kneeling.